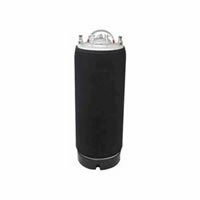 This keg insulator jacket combined with the ice blanket are ideal for taking your kegs to parties, keeping your draft beer cold and refreshing all day and night! AMERICAN MADE, USING ONLY THE HIGHEST QUALITY MATERIALS AND WORKMANSHIP TO ENSURE A DURABLE AND RELIABLE PRODUCT. Manufactured from neoprene to prevent temperature escape. Used together, they will keep keg cold for up to 24 hours.